Before we tell you about our suspension conversion, we need to say the original factory TDI suspension is perfectly adequate. We know of several B4-TDIs with over 500,000 miles with the original B4-TDI suspension. Many of the 1996 Passat B4-TDIs we have restored have the original suspension which is a 4-lug hub and a 14" wheel. The suspension conversion we have come up with is definitely superior to the "adequate" original suspension. Our suspension conversion is made up of different Volkswagen/Audi parts and select quality German aftermarket parts. Volkswagen made a GLX-VR6 gas-powered Audi-bodied Passat with a suspension that has a 5-lug hub, larger brakes, larger drive axles, etc. We use the whole front frame, axle assembly from a GLX. This is disassembled, cleaned, painted and re-assembled with VW Corrado spindles with over sized German FAG bearings, DE-54 Audi Calipers, new German ATE non-asbestos brake pads, new German Zimmerman 12.5 drilled rotors, new Bilstein struts, new tie-rods, new ball joints, new sway bar bushings, new drive axles, new springs and spring bushings all bolted together with new cadmium plated bolts. 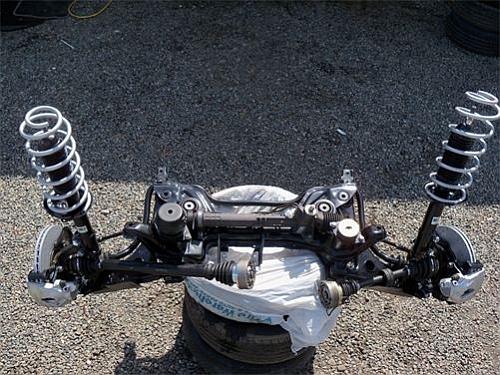 This whole assembly replaces the TDI front subframe/axle assembly. We use the original TDI axle bar. 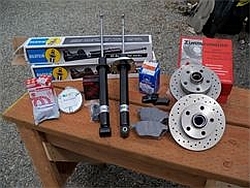 Here are all the aftermarket parts we use on the rear axle; German Zimmerman drilled rotors, German Fag wheel bearings, Bilstein struts, VW-Audi Calipers and German ATE brake pads. This upgrade provides about 30% more brakes, larger springs, performance struts, heavier duty drive axles, and a 5-lug wheel which will alloy you to use a 15", 16", or 17" wheel. There are several of these larger VW wheels available to fit these 5-lug hubs. These are some of the stock VW wheels that would work with this suspension including the alloy "bottle-cap" 15" alloy wheel that is accurate for the stock 1996-7 GLX suspension. These German Zimmerman brake rotors are also thicker so the side to side wheel base is wider with the conversion. This is the suspension VW should have used on these B4-TDIs, especially since these are German aftermarket parts. 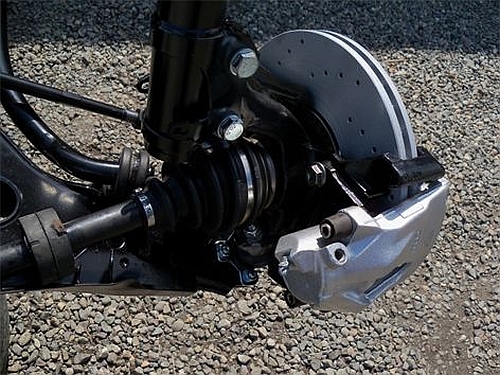 This will provide superior handling, better cornering, all together a far superior suspension. This conversion also raises the car up a few inches. Seems like our conversion customers appreciate a bit more ground clearance. Any factory built car can be improved on and this is what we do to make a B4-TDI handle and perform to its greatest potential. Wait till you drive one of these built like this, what a thrill!